Sponsored by The American Computer Science Association Inc. Welcome to the next 10 Billion Acres! Respect the Need for Air: try holding your breath. SUMMARY. This is a Green Paper™ that defines the true cause of Global Climate Change. We have also determined the proper solution for fixing the problem. Climate Change is just an 'early warning symptom' of a much greater threat to Humanity than most realize. Since 1492, civilization's sprawling expansion has progressively deforested 8 Billion Acres of the surface of Planet Earth. As a result, Humanity has progressively eliminated nearly 55% of the Trees (and associated plants) covering the Earth's surface. 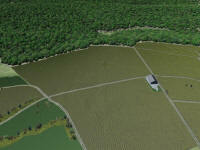 Average US grove growths have between 149 and 200 Trees per acre. Young Tree growths can yield as many as 1500 trees per acre. To allow greater termite and insect populations (critical for ecosystem balance), and more plant, loam and maintenance accessibility, 10 Billion Acres has earmarked 3-5 Billion Acres as a goal for reforestation at 200 trees per acre, minimum, 450 trees per acre, maximum. This leads to a quota of 1 Trillion Trees (a net minimum new growth figure) with a goal to replace them within 25-30 years to prevent Human Extinction from reaching a point of no return within the next 300 years. If we do not meet these goals, the Human Species will begin to die off in 150 years and will, unless nature intervenes on its own, be extinct by the year 2260 - 2300. Limiting Human Population or reducing Carbon Emissions from Industry, Transportation and Agriculture will have NO or NEGLIGABLE effect, less than than 1.6% on the timeframe, maximum. Reforestation of 5 Billion Acres or more and protection of the Algae/Phytoplankton/O2-producing-Micro-organisms in the Ocean from Agri and Industrial runoff, is the entire solution. The ACSA's 10 Billion Acres Project has fact checked and rechecked these figures for 15 years and found not even a single reason for doubt: Human Extinction is assured within 300-500 years, if we do not act now. By the time the extinction trend begins, we will have long since gone beyond a point of no return and it will be far too late to repair the Earth's atmosphere. Below is a picture of a forest clearing in preparation to building a shopping mall. There is a huge amount of information on this website including forest canopy depletion maps from this century that are indisputable. Feel free to reference it in any of your papers. As a result just of humanity's sprawling expansion (not logging), we've deprived the Earth's Carbon - Hydrogen - Oxygen - Nitrogen cycles of having sufficient CO2 sequestration by Trees and plants such that the natural balance has been entirely disrupted! That is causing heat to build and redistribute throughout our atmosphere, and gradually slowing down the atmosphere's most important and critical oxygen replacement cycle. The normal climatic cycle, which relies on the Trees, plants, algae, phytoplankton and certain CO2 breathing micro-organisms for full Oxygen (O2) production, has been disrupted and it is worsening. As it worsens the atmosphere steadily de-functionalizes until at a point in the not too distant future, it will no longer be able to properly support human life. In 1492, our atmosphere could replace/replenish itself in entirety on a 250-500 year cycle. Today, that cycle has risen to more than 2500 years and is heading towards 5000. Eventually, it will take too long, and human existence will be threatened by atmospheric collapse. We must act now, or by the time it reaches the extinction level, it will be TOO LATE! Our first priority: replace the lost Trees and plants. Second: protect the phytoplankton, Algae and other Oceanic and River Oxygen-producing microorganisms. Simple, easily implemented steps are all it will take. But if we continue to ignore our stewardship responsibility, Planet Earth will become uninhabitable and Humanity will become extinct! We can protect the Atmosphere's oxygen and gas balances in such a way as insures the Earth's ability to support human existence. All we need do is replant the trees, nurture them, and protect our Oceans and Rivers from agricultural and industrial run-off! HELP US START THE RE-PLANTING PROCESS! Here's the problem we face, as well as a definition of the real causes of Global Climate Change: the world's climate and temperatures were stable and safe for humanity 500 years ago. We rely upon Trees, Plants and Algae (including Phytoplankton and microbial forms that live on CO2) to produce the Oxygen which we breathe and the atmosphere we live in from CO2 emitted by volcanoes and plant de-comp. We disrupted the whole cycle when we cut down over 54% of the trees! We have a rare opportunity to replant them and restore the balance. Since 1492 Human Civilization has cleared nearly 8 Billion Acres of Trees. We've gone from 18.5 Billion Acres of Trees to 8.5 billion acres. We've cut down many more, but many have re-grown. The result: we have about 54% less trees and plants on Earth today. As a result there is no longer sufficient Tees and Algae (and Phytoplankton/Microbes) on the Planet to reduce the amount of Carbon added to the Atmosphere by Volcanic Activity and Plant Decomposition alone! As a result, CO2 is steadily increasing in the Atmosphere! Each year, the amount of carbon they produce exceeds the Trees and Algae/Phytoplankton's/Microbes ability to reduce carbon by 4.5 Billion Tons. As a result, since 1492, 730 Billion Tons of Carbon have accumulated in the Atmosphere. In addition, Human related emissions added from an additional 1.1 to 1.6 Billion tons of Carbon more each year. But if we only eliminate ALL HUMAN RELATED EMISSIONS, 4.5 Billion tons would still accumulate every single year! We cut down so many trees, that what's left WONT DO THE JOB! In fact, within 25 years if we do not replant the Trillion Trees we cut down and they have not reached 15-18 years maturity, humanity will become extinct between 250 and 500 years from now and in the interim, climate change will create intolerable living conditions on Earth! The Tree clearing was done mainly by civilization's expansion and fires. Logging and Wood Industries are generally respectful of the forests and replant forest areas they perform logging activities in so that new growth will eventually become wood products (with some noteworthy exceptions). Civilization has also cleared plant life in corresponding amounts. Trees, Plants and Algae (and Phytoplankton/Microbe Organisms in the Ocean), through Photosynthesis, use the Sun's energy to metabolize nutrients, where certain key gasses they "inhale" and "exhale" convert Carbon Dioxide (CO2) to Oxygen (O2). Without plants, trees and algae/phytoplankton/CO2-consuming Microbes, we'd be doomed... Without CO2, plants, trees and algae (and phytoplankton/CO2 consuming microbes) would be doomed. Such represents an ageless symbiotic biological partnership which hangs in the balance. Yet we continue to irresponsibly cut down more trees than we replant, despite the absolute scientific proof that such a course of action is suicidal. If we keep cutting down trees and plants, the Atmosphere will become tragically damaged, leading to our extinction for maged, leading to our extinction for LACK OF SUFFICIENT SUSTAINABLE O2 in the AIR FOR US ALL TO BREATHE! The true threat is the ongoing disruption of the environmental chains that produces Oxygen which are far more at risk! Humanity, and all life that breathes Oxygen (O2), are at risk of becoming extinct. Deforestation like this area cleared in Brazil's Amazon (at left) is cited in a landmark study as one factor that is undermining Earth's ability to sustain humans in the future. If we don't have sufficient numbers and a proper balance of Trees, Plants and Algae(including Phytoplankton and CO2 consuming microbes), eventually we won't be able to breathe: the atmosphere around us will cease being able to support human existence in a sustainable manner. We've already caused the atmosphere to have a greatly lengthened cycle of Oxygen exchange (the time it takes to exchange all the Oxygen from CO2 and NO). The rate was much faster when there were more trees: 500 years was needed to completely replace all oxygen. As a result of deforestation it is taking place at a slower rate, relying upon Algae/Phytoplankton/CO2-using-microbes more than Trees and Plants versus the ratio in 1492. It has expanded fourfold, exchanging the oxygen at what is approaching a dangerously slow rate, causing a net decrease in the amount of oxygen (the atmosphere's ratio of oxygen to nitrogen has remained the same, so a corresponding decline in the volume of nitrogen has also taken place). It is now 2000 years (in 1492 it was more like 500 years) for a complete "change of air". Tree clearing, plant clearing, plant decomp and mankind's use of combustion, along with uncontrolled fires, have taken their toll, alarmingly so. Common Pond Algae: Scientists disagree - Plant or Animal? Yet due to Tree Deforestation, Algae, phytoplankton, and micro-organisms in the ocean that consume CO2 now produce 66%-75% of our Atmospheric Oxygen! But they are not sufficient to sequester all the CO2 supplied by Volcanos and Plant Decomp! This degradation of the ability to replenish oxygen and a change in the balance of Trees and Plants to Algae/PPlankton/CO2-consuming-microorganisims has reduced the atmosphere's ability to eliminate heat, as well as reduced its capacity to process CO2, and has reduced the amount of oxygen while maintaining its ratio. Heat is being redistributed to the poles, melting the ice shelves, raising the Ocean's level. If we do not replace the trees civilization has cleared, we're all in deep trouble. Unless we replace the Trees and Plants we cleared, and restore the balance of Trees to Algae/Phytoplankton/CO2-using-microorganisms, we face extinction through lack of breathable oxygen, nitrogen deficiency, global warming and widespread planetary flooding. But decreasing industrial, auto and waste emissions is not going to solve that problem, in spite of what some have argued. It will only prolong the likely day when we reach the "Zero Point of No Yield", where the atmosphere can no longer support human existence. Unless we plant trees in vast numbers, we'll reach that day blinded by our own inaction. Carbon Dioxide is the stuff we exhale. Carbon Dioxide is called, in short, a "Greenhouse Gas" because a) originally thought of in Horticulture as a set of nutrient or expelled Gasses found in the horticultural Greenhouse, used by plants and trees which convert CO2, one of the gasses, to oxygen and use or emit other gasses (it was originally noted that if such gasses built up in the top of a Horticultural Greenhouse, under the Roof, some of them, particularly CO2, tended trap the Sun's energy at the same time as the glass roof blocked infra red energy rising in water vapor from the floor: heating the Greenhouse, allowing the effect to be leveraged to keep plants warm); as well as b) because it is correspondingly one of the most significant causes of the alleged atmospheric "Greenhouse Effect": the rise in temperature that the Earth experiences because certain gasses, these same Greenhouse Gasses, in the upper atmosphere (water vapor, carbon dioxide, nitrous oxide, and methane, for example) trap energy from the sun and could be responsible for some aspect of Global Warming. The cause for the rise in CO2 is in general: reduction of the Earth's capacity to process it, animal life, decomposition of plants, volcanic activity, and human industrial and energy production activities, in that order. However, while the potential for Greenhouse Gasses to buildup in the Earth's upper atmosphere (which is being attributed incorrectly in the Press as a byproduct solely of Industrial Emissions and Fossil Fuel use) is what scientists are claiming is causing Climate Change, the lack of a roof over the Earth's atmosphere as is found on a Horticultural Greenhouse has led other scientists to question how so much CO2 and other greenhouse gasses could build up at the top of the Atmosphere, or are suggesting that CO2 distributes evenly throughout the Atmosphere. These scientists as insisting that the specific structure of the atmosphere is not the same as the roof of a greenhouse, and that gasses from human activities that heat the atmosphere can't appreciably accumulate tat levels sufficient to produce enough heat, or, in the case of CO2, rapidly ionize at high altitudes, producing Carbon fallout and Ozone which affixes to the Ozone layer at the top of the atmosphere, helping protect us from harmful solar radiation. Nonetheless, the public has come to be proselytized by the doomsayers, among them, former Vice President Al Gore, who insist CO2 will superheat the earth if we don't cut back on Auto, Energy and Industrial Emissions. The actual volumes of Plant/Oceanic/Fossil Contribution to Atmospheric CO2, in billions of tons: Note that the chart does not accurately depict Animal Life's respiratory contribution, which is 66+ Billion Tons higher than the figures indicated. Most studies promoting the Greenhouse Effect on Climate Change omit this key contributing factor so as to achieve "the scare factor" that Global Warming is from fuels and industry. In fact, O2 breathing animals contribute ten (10) times as much to the CO2 in the atmosphere as do fuels and industrial processes. However, the reduced volumes of Trees and plants has caused a shortfall in the ability of the Atmosphere and Planet to process CO2. The claims that we are experiencing a Greenhouse Effect in the atmosphere is attractive to those who might benefit from exploiting the concept. Politicians are latching on to this readily available claim for the purposes of political gain. For example, recent publicity efforts by former Vice President and present Venture Capital VP Al Gore says it's all about automobile emissions and fossil fuel use. He also claims that wasteful use of energy is the cause (he should talk! his family estate house uses as much electricity as a small community and is left running day by day!) 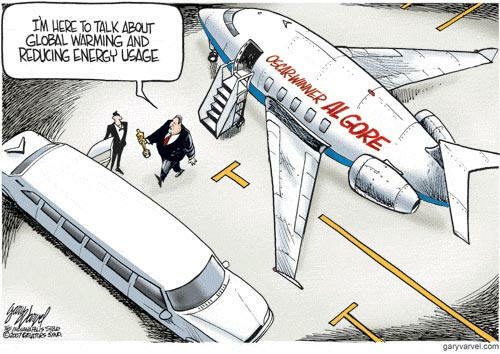 We beckon Mr. Gore to consider the science of 10 Billion Acres... The following represents the general consensus regarding Mr. Gore's publicitous campaign, which while laudable for its motives, seems suspiciously political rather than scientific. We say that in terms of what the primary climate change cause is, Al's just plain wrong: he's misdirecting the public away from that which would be most embarrassing to those invested in Coal and Wood products, and, entirely without necessity as they are not responsible for the loss of 8 billion acres of trees: civilization is, the spread of it caused the deforestation. In our research, we've discovered that climate change is the byproduct of our times, and that as to Oxygen depletion: it's all about the ratio of Trees versus Algae/Phytoplankton/CO2-using-microbes in bearing the load of Carbon Dioxide conversion into Oxygen. Were there enough Trees in the equation, Climate Change would not be occurring other than that which would be normal for the Earth's and Oceans' cycles during this Era. All the cars, industry and energy waste in the world would have little or no impact. Today, they are only having nominal impact. While Energy Management is vital to conserve energy sources, and emissions controls are vital to preserve the quality of the air we breathe and the water we drink, Climate Change of the Global Warming alleged by Al Gore would involve far more CO2 sources than your granddad's '65 Oldsmobile. In reality, Atmospheric Quality hinges on a far greater contributing factor: the loss of 8 Billion Acres of Trees since 1492 being THE PRIMARY CONTRIBUTOR. We've unwittingly rolled the Earth's climate back to a time of greater warmth, higher ocean levels, and more deserts, a time before the era of the Dinosaurs! Yet the real problem is that Al Gore is overstating Humanity's role in Climate Change, and ignoring the more threatening consequence: clearing of trees is threatening to undermine the entire Oxygen content of our atmosphere, as well as contributing in a smaller way to global warming and climate change. Today the Earth is, unknown to most climatologists apparently, in the middle of an ICE AGE. We are traversing the portion of that Age known as "the Interglacial Period", a period of natural warming characteristic of the midpoint of all ice ages: we are about 18,000 years into what is a normal period of warming expected to last about a total of 20-25,000 years. During the Interglacial Period, the Polar Icecaps melt normally, and Glaciers melt and recede. Fresh water is released until eventually, the temperature of the Earth reduces from a natural combination of orbital wobble change and higher water levels, and the next phase of the ICE AGE occurs: THE GREAT FREEZE. That freeze over is anywhere from 250 to 10,000 years away. In the meanwhile, Polar Cap melt and Glacial decline is a normal process of the Interglacial Period. Were we to base the analysis and evaluation of environmental climate change solely on the meltdowns occurring naturally, we'd be entirely incorrect in our conclusions. We have to actually compare the normal rate of change expected for such a period of glacial decline with today's melts. Which is difficult, since the prior ICE AGE and its Interglacial Period predated modern science, and judging it from geological formations is, at best, difficult if not impossible. Furthermore, we are in a cycle of current and salt content shift, a natural process in the Ocean, that causes heating and cooling in the Ocean, which is not affected by our industrial or automobile emissions, as verified by noted weather and environmental scientist, Dr. William Gray, a pioneer in the science of seasonal hurricane forecasts (news...> "Al Gore gets the Cold Shoulder"), who insists Gore and others are brainwashing and intentionally scaring people: "We're brainwashing our children," said Dr Gray, 78, a long-time professor at Colorado State University. "They're going to the Gore movie [An Inconvenient Truth] and being fed all this. It's ridiculous!" states Dr. Gray. 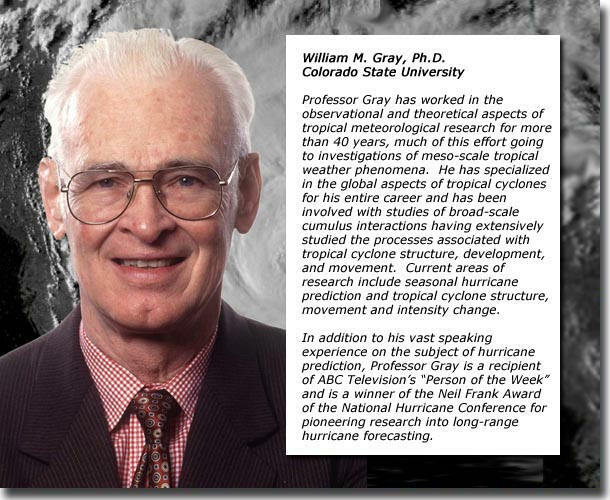 Dr Gray, whose annual forecasts of the number of tropical storms and hurricanes are widely publicized, said a natural cycle of ocean water temperatures - related to the amount of salt in ocean water - was responsible for the global warming that he acknowledges has taken place. "The human impact on the atmosphere is simply too small to have a major effect on global temperatures," Dr. Gray said. "It bothers me that my fellow scientists are not speaking out against something they know is wrong," he said. "But they also know that they'd never get any grants if they spoke out. I don't care about grants." In a different way, we agree with Dr. Gray. Controversially, the 10 Billion Acres project has determined that Industrial and Energy/Waste Greenhouse Gasses from modern commerce have only had a 2-4% impact on the overall climate change. Hence, we believe that the greater issue is the fact that the amount of Atmosphere, which is relatively speaking no thicker than the skin on an apple, bearing oxygen and nitrogen, has seen a 33% decline since 1492, caused by a shift in oxygen production off of the Trees cleared by civilization, and the shift of responsibility to produce it onto Algae/Phytoplankton/CO2-using-microbes in the vast majority. While the ratio of O2 to Nitrogen remains the same, our atmosphere is actually 33% less in overall volume, even though it occupies more or less the same area, it is much more rarified at its top than in 1492. Prolific amounts of Jet travel in the upper atmosphere has not helped much, but is largely responsible for only about 1/10th of 1%. Nonetheless, the clearing of trees to the extent civilization has, is an entirely different thing. This condition has not existed on Earth since long before the Dinosaurs and early Tropical Forests, when Trees were lower in number and the atmosphere's oxygen was the byproduct mainly of Algae/Phytoplankton photosynthesis or metabolism. This "tree decline" situation is getting increasingly dangerous. We could be pushing the Interglacial Period's normal meltdown of icecaps and glaciers to the point where they could collapse, leading to a drastic rise in the Ocean's level, flooding 1/4 of the continents on which we live. We could also be creating a "Zero Point of No Return" where the levels of Greenhouse Effect, CO2 buildup and degeneration of Algaes and Trees and Plants become no longer capable of sustaining human life by failing to produce enough Oxygen. We face possible extinction, as early as 100-250 years from now, if we continue to clear and not replant trees. Al Gore is aware of the real facts but is not speaking them. We believe, with all due respect, that Al Gore knows this to be factual, since he does make a very tiny mention of loss of trees causing some aspect of his claims of global warming. Yet being of political motives, we believe Mr. Gore has not fully considered the dangerous consequences that his misleading the public might cause: human extinction when the oxygen exchange rate in our atmosphere exceeds its capacity to support human existence. In spite of the worthiness of bringing public attention to climate change, the science quoted by Mr. Gore in his film "An Inconvenient Truth" does not reflect reality (citing experts in a Court Case who analyzed the film). Instead, Mr. Gore has minimized the responsibility of deforestation and coal mining, two key factors that have gradually reduced the Earth's Atmosphere's and Ocean's ability to process CO2 steadily since 1492 until now where Human Life is threatened with extinction. Such has changed the ratio of Trees to Algae/Phytoplankton massively in the favor of Algae/Phytoplankton, and has altered the Oceans and Rivers by eliminating the natural filtration afforded by Coal, which is "the Earth's Liver"**. Yet, with enough public awareness we can solve these problems, so long as we do not wait too long. We can re-grow the Trees and place rock filtration in place of Coal where it was mined out. Unfortunately, the consequences of Mr. Gore's publicity programs could undermine public awareness sufficiently to lead to a dangerous situation where nothing is done about reforesting and replacing the forever lost coal. Ecology is a delicate balance. Disrupt it in this major a way, and you clearly have environmental catastrophe on your hands. It's easy to get a multitude of grant hungry scientists to testify on your behalf. In Christopher Columbus's day, and Galileo's day, one could have obtained the signatures of a multitude of well respected scientists all of who would have sworn that the Earth was flat or that it was at the Center of the Universe. Mr. Gore has obtained the signatures of a multitude of their modern day peers swearing that Global Warming is about just auto emissions and fossil fuels. Those factors are far less significant than what the 10 Billion Acres Project is addressing. It's the big picture that everyone is missing, they think this website is just about preserving forests. Preserving a forest means replanting or protecting 10-20,000 trees. 10 Billion Acres is roughly: 15.625 million square miles, a size about half that of the African continent, so one can see that a lot of tree clearing, 8 Billion Acres, has taken quite a toll. Imagine a square 3577 miles on a side. That's about the area of trees cleared by Humanity since 1492. Even returning 1/4 of that in trees would go a long way toward solving the problem. When Columbus first landed in America in 1492 nearly 18.5 Billion Acres of Forests covered Planet Earth. Yet, the total human population of Earth was only about a half billion. Today, there are in excess of six billion human beings: but there are far fewer trees. Only 8.5 Billion Acres of Forests remain in the world today. As a result, the Earth's atmosphere has changed. There has been a near 33% reduction in Oxygen (O2) in our atmosphere since 1492. There has been a marked increase in un-breathe-able Carbon Dioxide (CO2), it has quadrupled. Trees represent the most significant source of breathable oxygen, we depend upon them to replenish our atmosphere as we exhale CO2. Yet the steady deforestation of the Planet since 1492 has led to a steady decline of Oxygen. The result: nearly 66% of all oxygen in our atmosphere comes from Algae/Phytoplankton and CO2 using microbes in the Oceans, Rivers, Lakes and Wetlands, where in 1492, only 33% relied on Algae/phytoplankton/CO2-using-microbes. The trees produced 66% of the oxygen and the Planet had the capacity to process 100% more Carbon Dioxide (CO2) per year, much of which was latent capacity. With human population on the rise, Humanity is on a near term collision path with the decline in the number of Trees. Today, Trees above the "northern dew line" carry most of the oxygenation responsibility: during Winter, Oxygen declines as the Trees naturally hibernate, in Spring it renews as they sprout leaves and grow. But it is not renewing at the levels it used to anymore. A very severer decomposition process known as "Eutrophication" and Dephosphate/Denitrogen/Deoxygenation could result in a cascade of damage to the atmosphere over a relatively short span of years that without being held in check by Tree planting, could lead to human extinction. We have determined that this is the byproduct of bad forestry management practices (not by any one group, just the global byproduct of all human activity, resulting in massive Tree and Plant life losses): deforestation, industrialization and logging, without Global Reforestry - the failure to practice planting self-sustaining forests on empty land and in cities throughout the world. 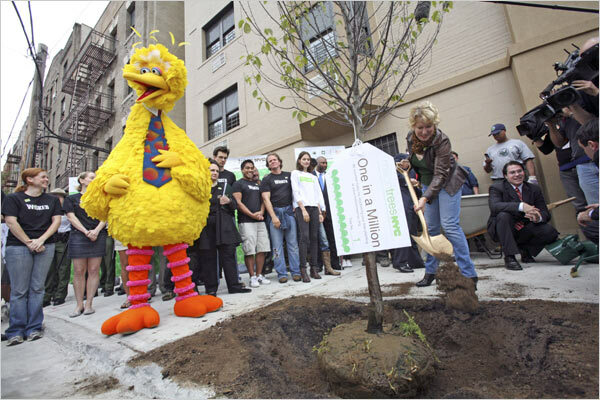 New York City's Mayor Bloomberg recently announced an initiative to plant a million new trees on the streets of the City of New York, for a project founded by famed actress and diva Bette Midler. While 8500 times too small a planting to solve the problem, it is a great step in the right direction. We say: keep up the good work, Mayor Bloomberg! Thank you Bette Midler: a definitive step in the right direction! Every city follow Bette and Mike's example globally and we'll be on the road to saving the Planet! However, we actually need to work faster and at a much larger volume of planting in time to head off climate change. Charles Foster, our learned advisor on Atmospheric Mechanics (the Mathematics of Atmospheric Behavior), has calculated that using a "planting factor" of about 100 to 294 trees to an acre (an aggressive figure), 1 million trees planted in New York City would represent only 3,400 to 10,000 Acres when compared to a typical forest. Replacing 3, 5 or 8 Billion Acres of trees represents nearly 1-3 million times that which New York City is planning, to give one an idea of the enormous magnitude of the solution. Mayor Bloomberg's historic effort represents a step in the right direction, one that needs to be followed by many, many more steps. The steady decline in the Earth's atmospheric O2 content is now officially a threat to Human Survival in the not too distant future. It will hit home far, far sooner than mere global warming, over population or pollution of the environment, however it will steadily worsen the climate changes. The lack of Trees (and plants) to "scrub" CO2 from the Atmosphere is also creating a "greenhouse gas canopy" (G2C) in the upper atmosphere, causing heat to be retained by the atmosphere, leading to climate change in a variety of ways. In various ways, this "CO2 Greenhouse Gas Canopy" being caused by Forest depletion worsens climate conditions. For example: it causes deflection and filtration (wavelength shift) in Sunlight, causing increases in temperature in some areas, decreases in others. For example: at high angles of Sunlight incidence, toward the poles, it is focusing the Sun's light on the Ice Cap's fringes, like a lens, increasing melting. 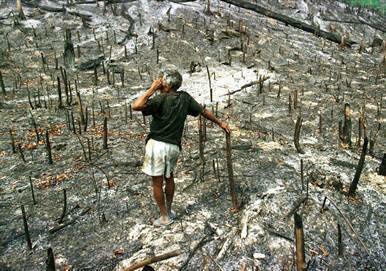 Adding to the complex problem is the clearing of rainforests, over 20% of these crucial rainforest areas are now gone. These dense zones of Trees and Plants are in constant danger from the spread of civilization and industry. The oxygen in our atmosphere is almost completely the product of the photosynthetic activity of green plants, phytoplankton, CO2-using-microbes and algae. The oxygen content of the atmosphere increased continuously during earth history since the first occurrence of organisms that were able to split water and perform photosynthesis. The increase stopped when a balance, today's 21 percentage by volume was reached. The source of the atmospheric oxygen was mainly water and to a lesser extend other oxides. Respiration and combustion are energy-consuming processes. The end product of respiration is carbon dioxide. The redox reactions taking place within organisms are discussed here. Millions of years ago, prior to the arrival of Algae, Phytoplanktons, CO2-using-microbes and Lichens which are symbiotically linked to Algae, there was no free Oxygen in the Atmosphere. The ecosystem that resulted from the arrival of Algae / Lichens symbiosis fostered the production of oxygen that allowed creatures who convert (redox) oxygen into CO2 to develop and thrive, and then, over land that Trees and Plants evolved to thrive on their CO2. As the Earth's Ecosystem of producers, consumers and decomposers gradually developed, a natural balance occurred. However, Human Activity has had significant impact on the over all balance, leading to a shift of oxygen production back onto Algae, Phytoplanktons and CO2-using-microbes, and away from Trees and Plants by our reducing the numbers to below 1/2 of the volume of Trees and Plants found on Earth in 1492. This has created a byproduct that has allowed fossil fuels and industrialization to increase CO2 in the atmosphere without it being converted by plants and algae, a general reduction in the volume of free O2 in the atmosphere, and an increase in heat in our Oceans and Atmosphere, leading to the presently recognized trend in climate change and icecap melts, leading to a more immediate danger of continental flooding. 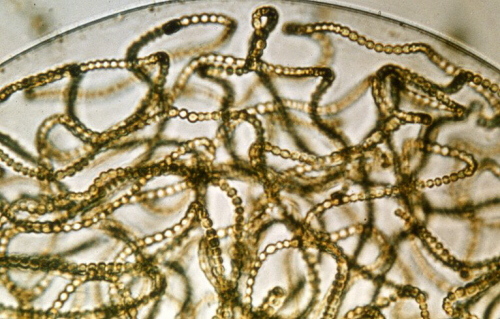 BLUE GREEN ALGAE GROWN IN A LABORATORY, UP CLOSE. The atmosphere contains about 1.3 x 1014 tons of free oxygen today. In 1492, the atmosphere was much larger at 2.0 x 1014 due to the presence of nearly 9 Billion more acres of Tree growth. The atmosphere was wider in diameter, with a greater carbon processing and heat dissipation capacity. 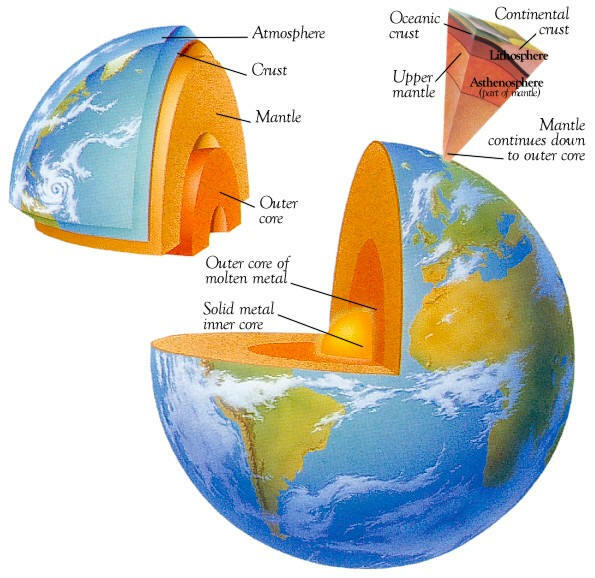 The lithosphere carries an even 5.5 x 1016 tons of bound oxygen, more than a hundred times more than the atmosphere. (In 1492 it bore nearly 6.75 x 1016 tons, so there has been some lithospheric reduction as well.) Its main part is bound as carbonates, silicates, sulfates, and other oxides. In the atmosphere, oxygen occurs mainly unbound, while the strongly ionizing cosmic radiation causes the production of ozone and atomic oxygen within the stratosphere. The ozone layer protects the biosphere effectively from short-wave UV-radiation. Over the decades, human activities have used up increasing amounts of oxygen while carbon dioxide is set free, while over 500 years, humanity reduced the Trees in number by some 100 Billion net losses. A decrease of free oxygen has continued at small rates until nearly 25% of it has depleted in the last 300 years, 30% over 500 years, from Tree, shifting the balance onto Algae, Phytoplanktons and CO2-using-microbes that has a potentially devastating effect on Oceanic ecology. A noticeable increase in the atmosphere's concentration of carbon dioxide has been registered as well. A main characteristic of the oxygen cycle is its connection with a part of the carbon cycle that plants and algae have a key position in. The modern exchange rate of atmospheric oxygen is a relatively high: 2,000 years. In other words: plants produce 1/2000 of the whole atmospheric oxygen each year and the same amount of oxygen is consumed by oxidation. Increasing tree growth from 8.6 Billion Acres found today to 18.5 billion Acres, will double the exchange amounts reducing the exchange rate to 500 years in capacity, quadrupling the ability to process carbon, and reducing the burden on Algae/Phytoplankton and CO2-using-microbes photosynthesis and metabolism to 1/2 its present level, while retaining the capacity potential of the Algae/Lichen symbiosis. The carbon dioxide of the atmosphere is completely exchanged within 300 years at present rates, which is not enough to equal the growth rate of carbon in the atmosphere produced by human activity. Increasing it to the level supported by 18.5 billion Acres of Trees and supporting plants, would decrease the carbon dioxide exchange cycle to roughly 1/4 (75 years). This would exceed the carbon release rate by human activity and fossil fuel consumption by nearly a factor of two, allowing the atmosphere to expand, cool naturally, and the seas being heated by retention by algae, plankton and microbes and processing by algae, phytoplankton and Microbes feeding cycles, to cool naturally, until reaching a proper heat to oxygen to carbon ration of .5 to 21 to 1, allowing the regular weather cycles to resume, and eliminating the Arctic and Antarctic melts and unusual weather being seen today altogether. The total amount of water, namely 1.5 billion cubic kilometer is completely split by photolysis and reproduced by oxidation within 2 million years. These values show the water cycle changes just little without the activity of plants, while the oxygen and the carbonate cycle would be altered drastically without plants. Nonetheless, the algae-fication cycle has been seen to retain heat and remove nutrients at rates that heat the oceans and the reduction in atmospheric pressure and atmospheric diameter, has shown the ability to raise ocean temperature as much as 1 degree per decade, a drastic change that can lead to total Arctic melt, and continental flooding, if we do not shift the burden of Algae and phytoplankton providing oxygen back onto Trees and supporting plants immediately (within the next 50 years). Lith·o·sphere (lĭth'oh-sfîr') n. The outer part of Planet earth, consisting of the crust and upper mantle, approximately 100 km (62 mi.) thick. Pho·to·syn·the·sis (fō'tō-sĭn'thĭ-sĭs) n. The process in green plants and certain other organisms by which carbohydrates are synthesized from carbon dioxide and water using light as an energy source. 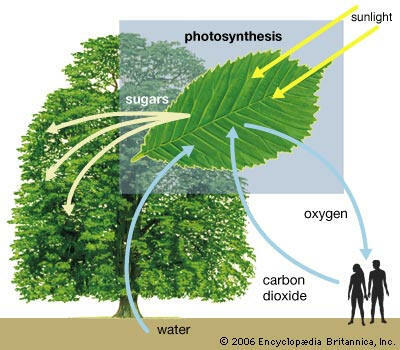 Most forms of photosynthesis release oxygen as a byproduct. rhizosphere (rī'z-oh-sfîr') n. The soil zone that surrounds and is influenced by the roots of plants. Within the rhizosphere, roots secrete a slimy lubricating substance, called mucigel, that cause the particles of soil to adhere to the roots, assisting in the uptake of water, and encourages the growth of nitrogen-fixing bacteria and other beneficial microorganisms. Eutrophication (U-trip-ficae-shun) n. excessive nutrients in a lake or other body of water, usually caused by runoff of nutrients (animal waste, fertilizers, sewage) from the land, which causes a dense growth of plant life; the decomposition of the plants depletes the supply of oxygen, leading to the death of animal life; "he argued that the controlling factor in eutrophication is not nitrate but phosphate". THERE ARE OTHER PARTS OF THE ATMOSPHERE THAT NEED HELP. 79 percent of the atmosphere consist of free nitrogen and at least the same amount of bound nitrogen is found in the lithosphere. These large reservoirs are not immediately available for plants. In this context, microorganisms have a central role. Nitrogen fixation is the cue. Plants use nitrogen almost only as ammonium and nitrate ions. In organic materials, nitrogen is mainly required for the production of the amino-groups found in proteins or nucleic acids. Nitrate and nitrite bacteria convert the amino groups back to nitrate or nitrite. 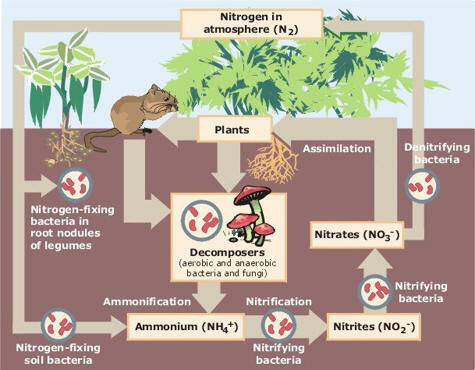 Nitrate-reducing bacteria living in the soil or in water reduce oxidized nitrogen compounds and do thus close the cycle. Nitrogen fixation and reduction do roughly balance one each other. The production of ammonium compounds and nitrates is a limiting factor of plant growth. It is true that the lithosphere contains almost unlimited amounts of nitrates, but they occur mainly in depths that are unreachable for plant roots. For humans, too, it is uneconomical to exploit this pool. Nitrogen compounds are usually very water soluble, large amounts are therefore lost by leaching. They may, especially if occurring in addition with extensive fertilizing, accumulate in lakes or ponds and cause eutrophication, a process which if it increases to include destruction of River and Ocean algae along with continued reduction of Tree and Plant life on earth could lead to our extinction. Many nitrogen fixing bacteria and blue-green algae are free-living, others live in symbiosis with plants like with the leguminosae Cycas or Ginko. The symbiotic species bind about ten times as much nitrogen as the free-living. Free-living bacteria and algae fix on average 1g/square meter/year. The highest measured value is 20 g/square meter/year. 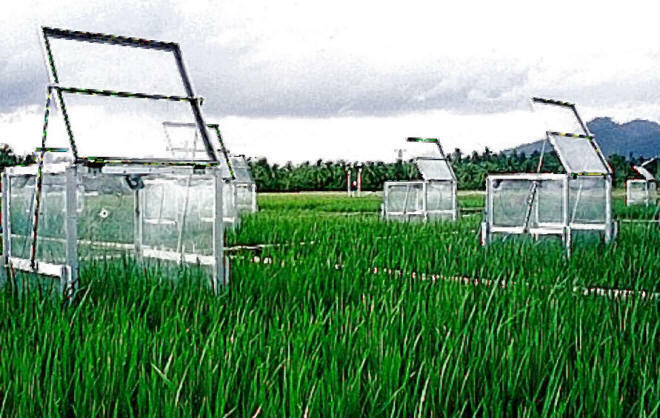 The relatively high rice yields of South and South-East Asia are partly based on the occurrence of extensive populations of blue-green algae like Nostoc. They live in the shallow stagnant waters where rice cultures are cultivated. In the whole contemplation of the nitrogen cycle, global or regional changes are of secondary importance. Far more important are the local concentrations and there again mainly the concentrations in the rhizosphere of the plants. 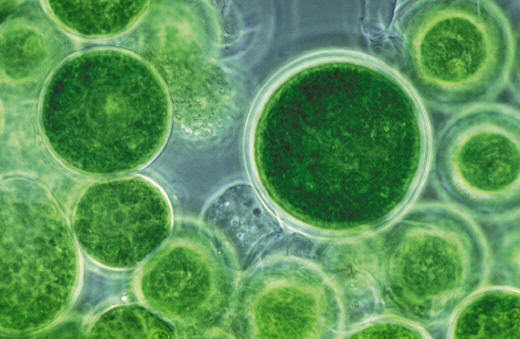 Hence the relationship between Algae/Phytoplankton/CO2-using-microbes to Trees and Plants that produce oxygen, has much more subtlety than previously believed, as Algae also play a vital role in creation of the nitrogen nutrient cycle for plants, and in CO2 that emits from the ground where decomposing plant biological material is disturbed. Disruption of the balance of Trees and Plants versus Algae/Phytoplanktons/microbes, has caused, among other things, a high nitrogen overload content to fall in rainstorms, leading to so-called "Acid Rains" that damage plants and human activity. Over the years, the largest disruption has occurred due to over-blooming of algaes, at a disproportionate level, leading to oxygen production at the expense of nitrogen distribution, further decreasing the atmospheric nitrogen cycle and ability to dissipate heat and supply appropriate nutrients to that which feeds humanity. Effects on the Phosphorous and Sulfur elements of the Atmosphere are also significant but bear further analysis elsewhere on this website. At the very poles, the Sun's heat is heating the upper atmosphere by higher concentrations of CO2 in small amounts, but largely due to the Interglacial Period, the part of this ICE AGE during which the atmosphere heats, the oceans warm a bit, and the Polar Caps and Glaciers rapidly melt. That causes lower temperatures right at the Poles, feeding ice formation into the melting fringe packs with more ice, a recycling effect accompanied by the increasing general level of water temperature globally led by Algae blooms. This has the consequential effect of slowly decreasing the concentrated levels of the Polar Ocean temperature (slowly, because water expands when it freezes, contracts as it melts) lowering temperatures in the northern most Ocean currents, drawing them up to the Poles to cool them, while the remaining 85% of the Ocean is heating up. When the northern currents chill, it leads to a not quite as severe, yet no less dangerous "The Day After Tomorrow" (2004 - Roland Emmerich) like effect: increasing snow amounts in the northern areas during Winter, pockets of extreme snow, and increased atmospheric turbulence towards the middle regions in the Spring and Summer, and a worsened Hurricane / Typhoon Season and warmer middle states weather, depleted water in drought prone areas and so forth. This has the bad side effect of creating worse periods of collateral storm systems, raising higher summer temperatures, causing much more coastal flooding damages and more beach erosion, which when coupled to the Ocean's temperature changes due to salt content this decade, is causing Scientists to misread the changes. Resultantly, far more rain occurs in some areas, causing land flooding and river overflow flooding, while barometric effects cause wind change, shifts to the Jet Stream, and other major air flows. That change has potentially catastrophic impact on current Farming zones, the earth's food producing centers. Increased arid dryness and drought drastically and unexpectedly in various parts of the world, could lead to "dustbowl" syndrome in areas ordinarily the source of the world's foods. The combination when Solar Flare cycles peak and heat the middle of our atmosphere towards the equator, can be deadly in terms of storm violence and tropical surges, as seen when Hurricane Katrina nearly washed Louisiana and parts of Alabama and Mississippi out to sea a few years back. As the air pressure drops or gas composition changes, the density variance and changes in the air-water-pressure process of the atmosphere, and vast temperature variances that happen at the same time, lead to more and more, worse and worse storm systems. Towards the Equator and mid regions, Sunlight passes through it in one direction, heating the oceans and land, but Infrared Energy (heat) fails to dissipate outwards, is reflected back by the CO. 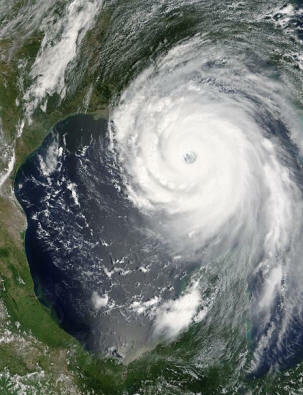 The results: hotter Summers with scorching weather and more Hurricane and Tornado activity, worsened by the reduced (lower barometric) pressure dips caused by reduced Oxygen in the Earth's Atmosphere. The stabilizing factors are defeated by this change, worsened during the peak of the Solar Sun Spot cycle, which heats the earth faster than during Sun Spot decline. The effects, if we do not act now, will be permanent and disastrous: the eventual death of 80-90% of living humanity at the time the collision happens: once atmospheric depletion due to deforestation when oxygen and demand for oxygen from human population growth outruns it. Our scientists have calculated that that collision could happen less than 100 years from now. Unfortunately, if we do nothing to increase the number of forests and trees, by then it will be too late to do anything about. Since tree growth and fundamental reforestation in nature without our help could take hundreds of years, once oxygen drops below a certain level: Humanity will simply start dying off until the ratio of trees to humans (T2H2APM) to Algae/Phytoplankton/Microbe balances off until we do something about it, we have to equalize the ratios (called: the Perfect Climate) to achieve proper ratios, which would also have the secondary effect of reducing the impact of Industrial Carbon / CO2 to a manageable one. Human Health is already beginning to suffer globally today as a result of the reduced oxygen content of our atmosphere, a problem worsened by the emission effects of industrialization, the internal combustion engine, high speed transportation technology and population growth. The 10 Billion Acres Fund represents a wholeheartedly new dimension in solving the problem of Atmospheric Deterioration. There are untold acreage of the Planet's surface which are available to plant high oxygen producing trees, such as the Ginkgo, the Elm and the Balsam Pine. Each tree type is suited to a specific part of our environment, each contributes far more to us than it needs to survive. Trees planted where other human industry and activity is not, represents, if planted consistent with environmental and agricultural standards, a huge contribution to the survival of Human Life. One needn't be a so-called "Tree Hugger" to understand why. Extracting poisonous greenhouse gasses such as CO2 from the environment, trees produce O2 while helping recycle water, nitrogen sources, and supporting an enormous ecology of symbiotic plants, animals, insects and most importantly, bacterium and mites that are the roots of plant survival on our planet, without which the rest of our environment would simply collapse. This byproduct ecology consequently contributes to other plant growth, which likewise cleans and purifies the atmosphere, providing gasses that enable us to breath. Our Motto: "Don't fix blame, fix the problem." First and Foremost, ACSA intends to raise funds to sponsor TREE BANKS™. We are seeking means to build 500 such banks nationwide, averaging 10 per state. 2000 Globally. Producing a net of 2 Billion Trees plantable per year. Eventually, increasing the number to 20000 Tree Banks, so that 1 Trillion Trees can be planted within 50 years. Simply put, by reforesting "another 3, 5 or 8 billion acres" humanity can return the Planet to a state where there is room for Humanity reversing these dangerous climate and atmospheric changes and decreasing human health risks (oxygen is an exceptional antiviral and antibacterial agent). Not doing so is beyond irresponsible: it could be suicidal. Lack of sufficient breathable gasses may be irrevocable, at the present state of deforestation (the removal of trees), in less than 500 years. In only 100 years, general human health will begin to visibly decline just as a result of lack of O2 and other gasses in our atmosphere, in fact we have already begun to experience this decline, but it will accelerate greatly. By 250 years from now, Human Populations will begin to decline as a result of the lack of support for Human lung function inside the Earth's atmosphere, but not rapidly enough to undo the damage: by 500 years from now, humanity faces very rapid extinction in the space of decades, returning Humanity to a bare few hundred million in total number, a global population under 1/4 billion, if that. Billions upon Billions will die off quite rapidly. And all of civilization's great advances and infrastructure will die with them. The solution is free, having neither negative nor conflicting goals. It is estimated that the Continental United States alone has 10 million square kilometers of land, of which roughly 18% could be used as "Neo Forests" (NeoFors), protected areas in which planted trees could be sustained without habitat encroachment or disruption, indefinitely. With 1 Square Kilometer equaling approximately 247 acres (maximum), with an estimated 75% effective treeing ratio, planting in Continental USA alone could, under the right conditions, reach as far as 1.5-1.75 Billion Acres of New Tree Growth, using lands made arable for Tree growth through proper nursery and forestry. The major continents on earth can each contribute from .75-2 Billion Acres apiece, yielding a net increase of approximately 5-8 Billion Acres, over 100 years, of New Tree Growth, the so-called "Grand Arbor Design". In that time period, the Earth's atmosphere would be vastly improved, with 33% higher oxygen and reduction in CO2 and CO by 85%. Simultaneously, the Oceans would also improve, with reduction in CO2 and acidity that is greatly imperiling Ocean Coral Reefs, plant life and sea creatures of all kind. Such would more than quintuple the success rate of Ocean based fish reproduction, creating larger volumes of edible fish than existed at the time of Christopher Columbus, a boon for solving the Human Hunger problems. due to it's much richer oxygen contribution to the atmosphere to fight pollution. Relatively speaking: it virtually costs next to nothing for us to nursery young trees of all kinds in ACSA Tree Banks™, other than labor, water, fire prevention and some composting practices. After that, maintenance is technological and a very sound investment, once relocated to a final NeoFor. Certain trees, such as the Ginkgo Tree, are so hearty that they contribute 45% more oxygen than others, and last long life spans even if only planted on a Metropolitan City Street as evidenced by successful growth in NYC and elsewhere. Trees can be planted in enormous number each year, and billions of unused, yet fertile acreage exists all over the world where trees can be planted that would contribute to breathable atmospheric conditions while having little or no other impact on the growth of human populations, where same would have little or no impact on human industry, yet the byproduct would be enormously valuable. Commercial byproducts would include the production of fertilizer, and the nursing of an abundance of saplings that could be supplied to the Logging Industry to help repopulation of legacy forests reserved for commercial logging. Money from same could be devoted to preserving Tree species for the purposes of reforestation, and for finding newer and more innovative ways to accelerate plantings and location selection, extending from simple forestation to the creation of diversified clusters of grove growth and metropolitan/suburban tree growing. Our goals are simple: bring about an end to Atmospheric Armageddon. Get the word out. We will work to expand sharing the revelations of our discoveries with the public at large, government, science and education. Form a coalition. People, business, science and government need to ally to solve this. Without a breathable atmosphere, humanity won't survive. As ours continues to deplete oxygen and buildup carbon dioxide, ill health will give rise at a worsening rate, and bad climate changes will deepened. The outlook could be a bleak one if we don't act now. Effect Change. Every state in the USA, for instance, has a Forestry Commission. We could induct them into overseeing the planting of trees and the creation of nurseries for saplings. City and County Governments have discretion over spending on parks and trees in city streets, suburban areas. Planting Trees is the only solution possible. Monitor and Guide. Every program of this magnitude needs monitoring, guidance and insurance that it will operate properly, without corruption, without deviation and without failure and without prejudice. Report. We will keep reporting what's being done. This is a global effort that will likely touch every last person on Earth in one way or another. 5 - 8 Billion Acres is a huge amount of space. It's going to take everyone, working together, to solve. Adjust and Compensate for Errors Made. We have no illusions: mistakes will be made along the way, disputes will occur, money problems will arise, politicians will be politicians, greed will interfere. We are going to have to adjust and compensate. We're human. We've already made one of the biggest mistakes in history, by allowing the volume of Trees to be reduced by more than 1/2. Every school child learns about Trees, Air, Oxygen, and CO2. Yet, despite the fact that Oxygen Depletion and CO2 increases from the 8 Billion Acres of Trees we've already cut down, coupled to the unanticipated impact of Solar Flare heating cycles and the changes in the Earth's angle of axis, most scientists and governments just seem not to have noticed the big picture, zeroing in on industrial factors as if to avoid the real cause. Accordingly, "error correction" will be required in the form of education, knowledge sharing and joint participation. To give you an idea of how humanity has underestimated the quantum degree of action need to save our world and repair our atmosphere: while the US Forestry Service has replanted 10 million trees since 1990 (news link). In spite of their well intentions, that represents only 100,000 acres. 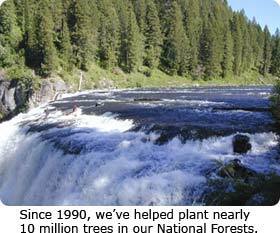 To plant 8.5 billion acres of trees (the minimum net requirement to equal the oxygen/carbon cycle and capacity of our planet as it was in 1492) would require a "net" (after logging and clearing planet wide) of 85 Billion trees, 8500 times as much as the effort that has been undertaken by the USFS. While of an extraordinary magnitude, the paramount importance of shifting the oxygen / carbon cycle to Trees and away from Sea Algae/Phytoplankton/CO2-using-microbes is enormous. The burden on the oceans' infrastructure is destroying the underlying lifecycles of our Seas, Rivers and Lakes, killing or altering the populations of fish, water creatures and water plants, leading to undermining of the planet's Algae. To process as much CO2 as it needs to to maintain the atmosphere, Algae is overgrowing and consuming nutrients from the oceans, rivers and lakes at beyond record rates. That is undermining the source of nutrients and leaving Algae exposed to disease, with humanity counting on it's oxygen production ability, putting all its eggs in the one basket. If it, the Oceanic, River and Lake Algae, dies off, which could be very likely within 50-100 years - if we don't subdivide the burden of the CO2 to Oxygen processing cycle by replanting the volume of Trees (and Plants) to 1492 levels: repopulation of the earth's Trees to a minimum of 17 Billion Acres, HUMANITY SHALL DIE WITH THE ALGAE/PHYTOPLANKTON and CO2-USING-MICROBES. Pollutants that kill the Algae or damage them, are worsening the problem. We need the Trees and Plants. Life on earth could be reduced to a small handful of small, rodent sized species as the remaining trees are inadequate to carry the burden. The Trees and Plants consequently will allow Algae to prosper, by helping contain runoff and pollution effects and by increasing controlled runoffs that Algae thrive on. ABOVE: US Forest Service effort to repair forests fall far short of Global Atmospheric Repair goals. In spite of their best efforts, the Forest Service has not made even a dent in global atmospheric depletion. 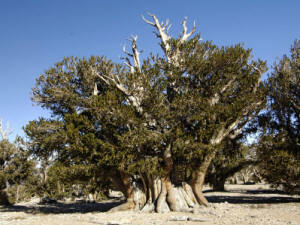 Too few trees have been replanted and in many areas where they tend to increase global warming. In the USA alone nearly 1 Billion new fresh acres of seedling Trees need planting towards the southern border. A heavy burden too much for the USFS, however we commend the Forest Service for the work it has done to repair the Natural Forests. Unfortunately, the depletion of this resource across the planet has been so disastrous over 500 years that we are well beyond able to survive just this amount of replanting. We need the Grand Arbors to fill the gap, or Humanity simply will not survive. To achieve the restoration to the 1492 level of 8.5 Billion Acres increase in trees, at 640 Acres per square mile, is 13.2 million square miles, an area roughly 1/10th the size of the Continents of Africa, North America, South America, Europe, Asia and Australia: so the Grand Arbor design, to return us to the Atmospheric pressure and size and heat dissipation and carbon processing, will require drastic steps. However, the alternative, global warming and flooding, over the course of the next 100 years, covering all major coastal cities, is far, far worse. with adjacent Resource and Soil Management / Maintenance Station. The Grand Arbor's first goal is to attain a Billion Acre planting zone across the northern prong of North Africa, in the uninhabited areas above the Sahara Desert. This would have the secondary effect of positively altering the aquifer level in North Africa, raising it to the point where the northern most uninhabited deserts would start receding and become naturally available to more plantings, increasing the size of the GA zone there to approximately 2 Billion Acres... Also, the natural creation of rain with weather patterns carried south by the Mediterranean winds would incubate natural growth in the Sahara Desert zone, reducing the Desert by at least 2.5% per decade to a lush vegetation zone. Then, upon completion of the North African planting, areas in Central/Southern USA, Central Mexico, and Europe would each be picked to attain individual Billion Acre planting zones. When complete, nearly Six Billion Acres will have been planted and Global Warming effectively reversed. Seedlings for various indigenous and appropriate trees would be ethically harvested and incubated, then planted. An additional 4 Billion Acres of plantings would follow, during which a half billion acre planting in more northerly areas would be undertaken to support the logging industry. Some have suggested covering a million square miles (.6 million sq km) would cover "all of Africa". That is not so. 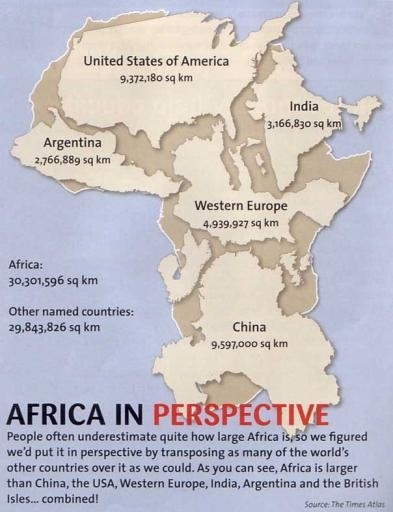 To put the size of Africa into perspective (and other areas...) here is a map. The notion of 'ethical harvesting" of seeds and mass nursery farms is a common heritage of the forestry industry, so more than sufficient means exist to obtain billions upon billions of saplings. 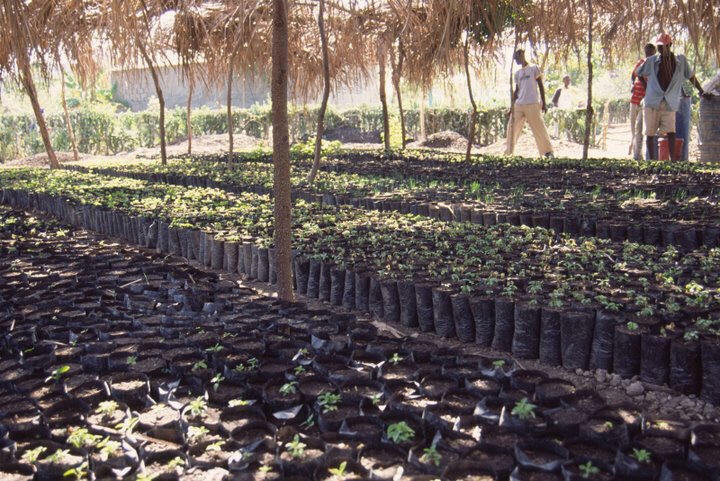 However, the trees have to be selected based on climatology, and the Arbors will have to be provided adequate water, soil, fertilizer and have some kind of temperature controls (water spray systems) to insure survival of the fittest trees for the region being planted. Despite high temperatures, initial plantings would be done under portable domes with temperature regulating covers and solar energy driven ventilation and irrigation until large enough "sub Arbors" achieved their own climatic balance. Then as the sub arbors are bridged and merged, they would become their own source of seeds, with careful genetic and heartiness monitoring to insure that the healthiest trees survive and that natural emulation of nature's "weeding out" process for unhealthy or damaged trees took place. Antifire provisions would be built into each Arbor as despite nature's desire to create storm driven lightning burns of forests, this would be carefully limited and controlled by fire brigading systems. Lastly, the density of each "superArbor" which resulted would be gradually increased. The scale on which this would be done would have a multi year span and would take enough time for each regional Grand Arbor to develop its own weather patterns and for our consulting science counsel to insure the successful development of each Grand Arbor. The trees would range from Ginkgo to Palm to Willow to Redwood to whichever tree was found to work indigenously in a particular zone. Selection would be based on compatibility with climate, efficiency and ability to interact with a diverse planting population. To regulate the Arbors, smaller plants, grasses, moss, and other flora would be steadily introduced, and resource centers maintained to continue nursing saplings for replacement and/or expansion purposes. Ten Billion Acres is a Global Resource Fund for Non-Profit Purposes, created by the ACSA, for the benefit of Humanity. The funds raised will be devoted to developing and implementing the Ten Billion Acre Reforestation Long Range Plans. Note, the Long Range Plans will take quite some time to achieve the goal of reforesting ten billion acres of tree growth, likely longer than it took for Humanity to deforest that amount of acreage since 1492. However, it is believed that within 50 years, the degeneration of Earth's atmosphere and depletion of breathable gasses will have been halted and largely reversed, and that within 100 years, the Planet will have long since been placed back on track to being able to atmospherically support Humanity. Within the space of several lifetimes, we intend to insure that the effort exceeds the growth of Human numbers and populations, can survive in perpetuity, and that new, innovative ways of foresting human population areas will be evolved to insure Humanity is not extinguished by atmospheric depletion. The Tax consequences of donating to the Global Resource Fund backing Ten Billion Acres are potentially significant in terms of reducing tax liability for the fiscal year of the donation. Please consult with your Tax Accountant or CPA for further information. We are always seeking Global Alliances who can help forward this project to reach its goals. You can reach 10BA by phone through the business offices of the ACSA Ten Billion Acres Project Office at 908-272-0016, or by email at "trees@acsa.net". To mail donation checks, send payable to "ACSA 10 Billion Acres Fund", Suite 2000, Cranford, New Jersey 07016 USA. General donations may be made by clicking here>. All donations are tax deductible under 501(c)3 of the IRC. If you are a Forest Scientist or Agriculture or Weather Expert and wish to donate time to assist us with the massive planning and logistical effort defined above, please email us at "trees@acsa.net" and provide information about your background... If you are a Government Official, and need more information, please do likewise, submit your questions to "trees@acsa.net". PRIVACY NOTICE: please refer to legal and privacy notices at our main website: http://www.acsa.net . Food and Agriculture Organization of the United Nations. (2004). The future of agriculture depends on biodiversity. Accessed March 1, 2007. Laurence, W. (2006). Biodiversity Erodes Fast in Amazonian Forest Fragments. Accessed March 15, 2007. Laurance, W., Nascimento, H., Laurance, S., Andrade, A., Ribeiro, J.,Giraldo, J., Lovejoy, T., Condit, R., Chave, J., Harms, K., D’Angelo, S. (2006). Rapid decay of tree-community composition in Amazonian forest fragments. Proceedings of the National Academy of Sciences, 103 (50), 19010-19141. National Cancer Institute. (2000). National Cancer Institute Fact Sheet: Questions and Answers about NCI’s Natural Products Branch. Accessed March 1, 2007. Plotkin, J. Potts, M., Yu, D., Bunyavejchewin, S., Condit, R., Foster, R., Hubbell, S., LaFrankie, J., Manokaran, N., Seng, L., Sukumar, R., Nowak, M., and Ashton, P. (2000). Predicting species diversity in tropical forests. Proceedings of the National Academy of Sciences, 97 (20), 10850-10854. Rainforest Alliance. Research and Resources: Tropical Forests in Our Daily Lives. Accessed March 16, 2007. Wilson, E. (2001). Vanishing point: on Bjorn Lomborg and extinction. Grist Magazine Website. Accessed March 1, 2007. Fearnside, P. (2006). Fragile soils and deforestation impacts: The rationale for environmental services of standing forest as a development paradigm in Latin America. In: D.A. Posey & M.J. Balick (eds.) Human Impacts on Amazonia: The Role of Traditional Ecological Knowledge in Conservation and Development, 158-171. New York: Columbia University Press. Lindsey, R. (2004). From forest to field: How fire is transforming the Amazon. NASA’s Earth Observatory Website. Accessed March 1, 2007. McSweeney, K. (2006) Distinguishing the Indigenous from the Rural Poor: Reply to Engelman et al. Conservation Biology, 20 (4), 1318-1320. Schwartzman, S., and Zimmerman, B. (2005). Conservation Alliances with Indigenous Peoples of the Amazon. Conservation Biology, 19(3), 721-727. Associated Press. (2005). Nun’s murder mobilizes Amazon activists. MSNBC Website. Accessed March 15, 2007. Environmental News Service. (2006, March 8). 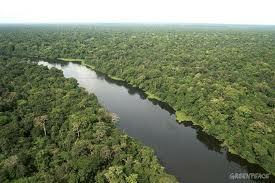 USAID $50 Million May Entice Conservationists to Violent Amazon. Environmental News Service Website. Accessed March 15, 2007. U.S. Department of State. (2006). Background Note: Papua New Guinea. U.S. Department of State Website. Accessed March 15, 2007. Fidell, K., Knutson, T., and Milly, P. (2006). Weak simulated extratropical responses to complete tropical deforestation. Journal of Climate, 19, 2835- 2850. Negri, A., Adler, R., Xu, L., and Surrat, J. (2004). The impact of Amazonian deforestation on dry season rainfall. Journal of Climate, 17, 1307-1319. Silva Dias, M. A. F., et al. (2002). Cloud and rain processes in a biosphere-atmosphere interaction context in the Amazon Region. Journal of Geophysical Research, 107 (D20), 8072. Werth, D., and, Avissar, R. (2005). The local and global effects of African deforestation, Geophysical Research Letters. 32, L12704. Werth, D., and, Avissar, R. (2005). The local and global effects of Southeast Asian deforestation. Geophysical Research Letters, 32, L20702. Werth, D., and Avissar, R. (2002). The local and global effects of Amazon deforestation. Journal of Geophysical Research, 107(D20), 8087. Cleveland, C., and Townsend, A. (2006). Nutrient additions to a tropical rain forest drive substantial soil carbon dioxide losses to the atmosphere. Proceedings of the National Academy of Sciences, 103 (27), 10316-10321. Fearnside, P. (2006). Tropical deforestation and global warming. Science, 312, 1137. Fearnside, P., and Barbosa, R. (1998). Soil carbon changes from conversion of forest to pasture in Brazilian Amazonia. Forest Ecology and Management, 108 (1-2), 147-166. Prepint. Accessed March 15, 2007. Houghton, R. (2003). Why are estimates of the terrestrial carbon balance so different? Global Change Biology, 9 (4), 500-509. Murty, D., Kirschbaum, M., Mcmurtrie, R., and Mcgilvray, H. (2002). Does conversion of forest to agricultural land change soil carbon and nitrogen? a review of the literature. Global Change Biology, 8 (2), 105Ð123. Richey, J., Melack, J., Aufdenkampe, A., Ballester, V., and Hess, L. (2002). Outgassing from Amazonian rivers and wetlands as a large source of tropical CO2. Nature, 416, 617-620. Siegert, F., Ruecker, G., Hinrichs, A., and Hoffmann, A. (2001). Increased damage from fires in logged forests during droughts caused by El Niño. Nature, 414, 437-440. Asner, G., Broadbent, E., Oliveira, P., Keller, M., Knapp, D., and Silva, J. (2006). Condition and fate of logged forests in the Brazilian Amazon. Proceedings of the National Academy of Sciences, 103 (34), 12947-12950. Giest, H., and Lambin, E. (2001). What drives tropical deforestation? A meta-analysis of proximate and underlying causes of deforestation based on subnational case study evidence. LUCC Report Series; 4. Belgium: Land-Use and Land-Cover Change (LUCC) International Project Office. Accessed March 1, 2007. Morton, D., DeFries, R., Shimabukuro,Y., Anderson. L., Egidio Arai, del Bon Espirito-Santo, F., Freitas, R., and Morisette, J. (2006). Cropland expansion changes deforestation dynamics in the southern Brazilian Amazon. Proceedings of the National Academy of Sciences, 103 (39), 14637-14641. Jasinski, H., Morton, D, DeFries, R., Shimabukuro, Y., Anderson, L., and Hansen, M. (2005). Physical Landscape Correlates of the Expansion of Mechanized Agriculture in Mato Grosso, Brazil. Earth Interactions, 9, Paper 16, 1-18. Rosenthal, E. (2007, January 31). Once a dream fuel, palm oil may be an eco-nightmare. New York Times Online. Accessed February 5, 2007. Food and Agriculture Organization of the United Nations. (2005). Change in the extent of forest and other wooded land. 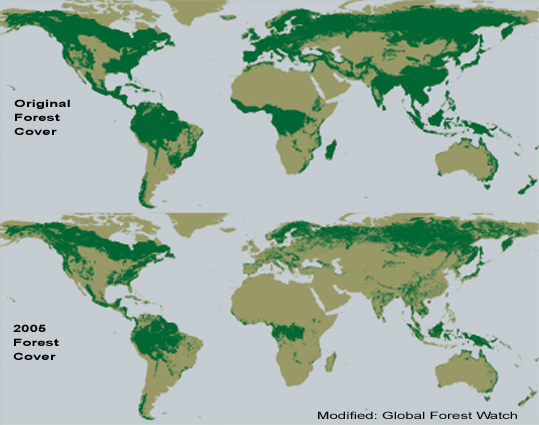 Global Forest Resources Assessment 2005. Accessed March 1, 2007. Skole, D., and Tucker, C. (1993). Tropical deforestation and habitat fragmentation in the Amazon: Satellite data from 1978 to 1988. Science, 260 (5116), 1905-1910. Achard, F., Eva, H., Stibig, H., Mayaux, P., Gallego, J., Richards, T., and Malingreau, J. (2002). Determination of deforestation rates of the worlds humid tropical forests. Science, 297 (5583), 999-1002. Fearnside, P., and Laurance, W. (2003). Comment on “Determination of deforestation rates in the world’s humid tropical forests.” Science, 299 (5609), 1015. Asner, G., Nepstad, D., Cardinot, G., and Ray, D. (2004). Drought stress and carbon uptake in an Amazon forest measured with spaceborne imaging spectroscopy. Proceedings of the National Academy of Sciences, 101 (16), 6039-6044. Curran, L., and Trigg, S. (2006). Sustainability science from space: Quantifying forest disturbance and land-use dynamics in the Amazon. Proceedings of the National Academy of Sciences, 103 (34), 12663-12664. Nepstad, D., Veríssimo, A., Alencar, A., Nobres, C., Lima,E., Lefebvre, P., Schlesinger, P., Potter, C., Moutinho, P., Mendoza, E., Cochrane, M., and Brooks, V. (1999). Large-scale impoverishment of Amazonian forests by logging and fire. Nature 398, 505-508. Nepstad, D., McGrath, D., Alencar, A., Barros, A. C., Carvalho, G., Santilli, M., and del C. Vera Diaz, M. (2002). Frontier Governance in Amazonia. Science, 295 (5555), 629-631. 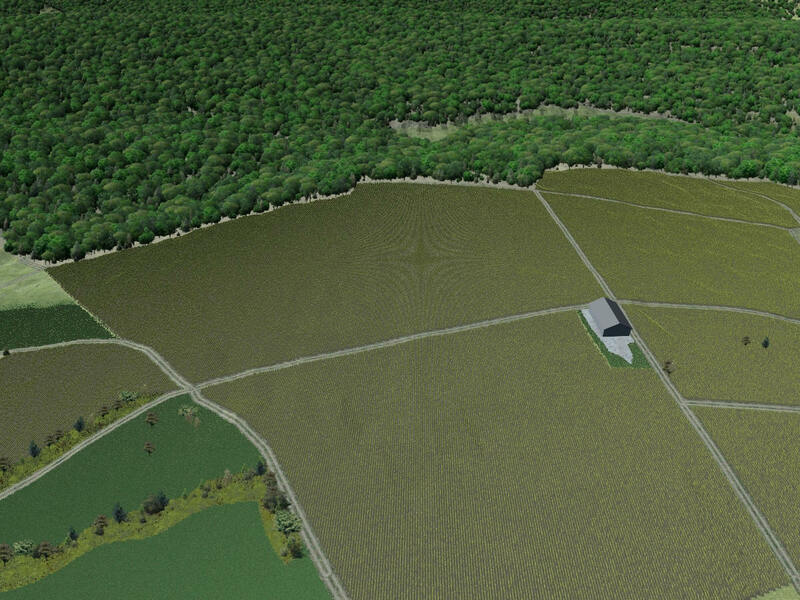 University of Maryland Global Land Cover Facility. MODIS Vegetative Cover Conversion Webpage. Global Land Cover Facility Website. Accessed March 1, 2007. University of Maryland Geography Department. (1998). NASA Landsat Pathfinder Humid Tropical Deforestation Project Description Webpage. NASA Landsat Pathfinder Humid Tropical Deforestation Project Website. Accessed March 1, 2007. University of Maryland Geography Department. Central African Regional Program for the Environment Webpage. Accessed March 16, 2007. Butler, R. (2006). Amazon conservation efforts must come soon to save world’s largest rainforest says leading scientist: An interview with Dr. Philip M. Fearnside of the National Institute for Research in the Amazon. Mongabay Website. Accessed March 16, 2007. Curran, L., Trigg, S., McDonald, A., Astiani, D., Hardiono, Y., Siregar, R., Caniago, I., and Kasischke, E. (2004). Lowland Forest Loss in Protected Areas of Indonesian Borneo. Science, 303(5660), 1000-1003. Nepstad, D., Schwartzman, S., Bamberger, B., Santilli, M., Ray, D., Schlesinger, P., Lefebvre, P., Alencar, A., Prinz, E., Fiske, G., and Rolla, A. (2006). Inhibition of Amazon Deforestation and Fire by Parks and Indigenous Lands, Conservation Biology, 20 (1), 65-73. Schwartzman, S., Moreira, A., and Nepstad, D. (2000). Rethinking Tropical Forest Conservation: Perils in Parks, Conservation Biology, 14 (5), 1351-1357. Soares-Filho, B., Nepstad, D., Curran, L., Cerqueira, G., Garcia, R., Ramos, C., Voll, E., McDonald, A., Lefebvre, P., and Schlesinger, P. (2006). Modelling conservation in the Amazon Basin, Nature, 440, 520-523. Nepstad, D., Stickler, C., and Almeida, O. (2006). Globalization of the Amazon Soy and Beef Industries: Opportunities for Conservation. <> 20 (6), 1595-1603. Santilli, M., Moutinho, P., Schwartzman, S., Nepstad, D., Curran, L., and Nobre, C. (2005). 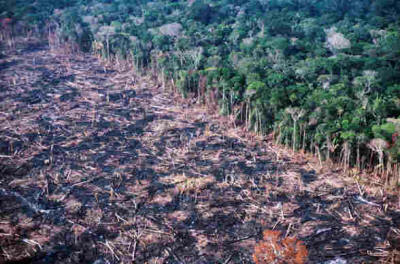 Tropical deforestation and the Kyoto Protocol. Climatic Change, 71 (3), 267-276. Harvard (2000) http://adsabs.harvard.edu/abs/2000physics...9014S Alarming Oxygen Depletion caused by Hydrogen Combustion..., accessed January 23, 2007. Cal State Long Beach: Ron Merrit Morris (2007) A Beginner's Guide to the Biochemical Cycling of Atmospheric Oxygen. Accessed January 22, 2007. Univ. of Plymouth/UK: John Summerscales (2006): MST 324 Quality Assurance and Safety Engineering: based on Adisa Azepagic : the Environment and Sustainable Development. Accessed January 22, 2007. Copyright © 1995-2009, 2010 ACSA Inc. (a 501(c)3 foundation under the IRC Code) All rights reserved. 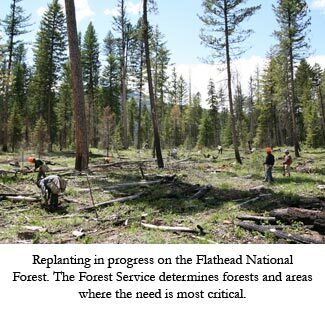 Figures for reforestation on this site are subject to change without prior written notice, on account of the variation in potential planting sites, political circumstances, fiscal issues, other variable circumstances and issues such as available irrigation, management and fertilizer considerations.